I am a budding amature photographer currently on a working holiday in Australia, which gives me great oportunities to take some great pictures. 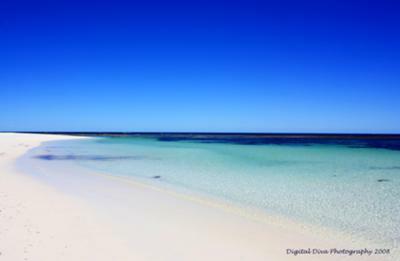 I took this shot of Hangover Bay on a fine spring morning in Western Australia during the holiday part of my trip. What a place to recover from a hangover! I have adjusted the saturation in Picasa software. Any comments, good or bad are greatly appreciated! I think that this photograph of the beach is great. I am going to put it on my home page for the next month. This picture makes me want to go and swim in that lovely blue water. The sand is really white and inviting. Have you got your own gallery or website setup anywhere? If you want I can put a link on here for you to let people see more of your work. Thank you for your kind comments Mark. My website is Digital Diva Photography. I will also put your website link on my site. WOWOW!! This is like a minimalistic painting...some awsome strokes of the painter with knife on canvas...too good! !